Andrew holds a very bright Muskegon river steelhead from recent outing with great friends, who have been making the trek to west MI for nearly 2 decades to fish together with me. Last night we got some much needed rain. The Rogue River came up and peaked around 360 cfs. It is flowing with a light coffee stain. The gauge on the Grand River is back online and currently sitting around 4500 cfs and rising. The Old Au Sable Fly Shop Fishing Report. As we flip the calendar to November it is full-on steelhead season. 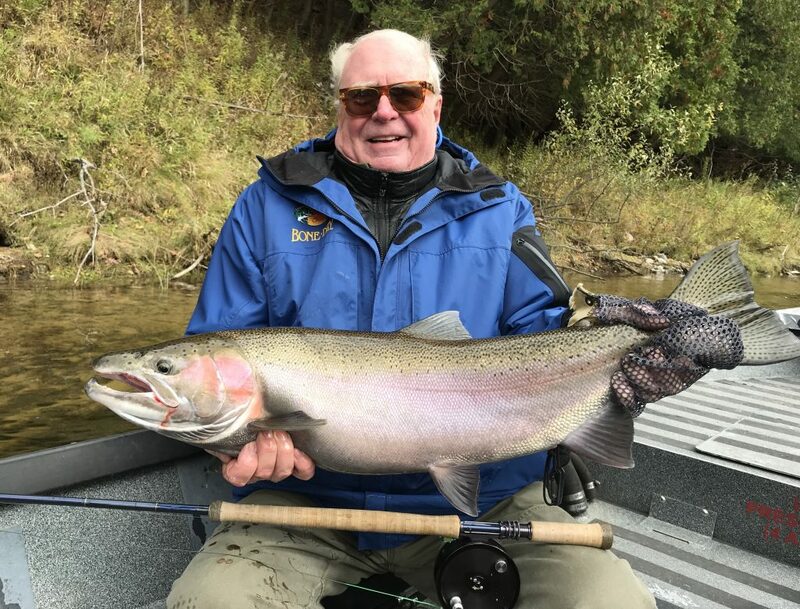 Almost all of the salmon are gone in rivers like the Manistee, Betsie and Platte but there are a few remaining chinook and coho salmon around providing an egg drop to help keep the steelhead focused on eggs. Read full post: Fall Chrome Surprise!